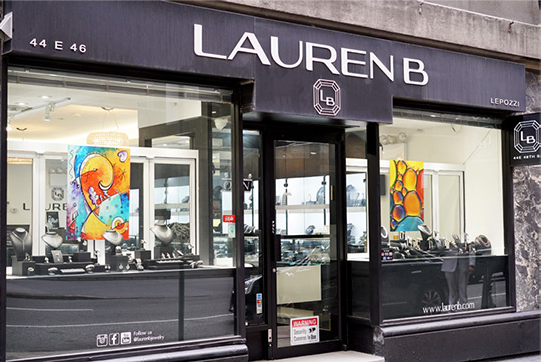 Welcome to Lauren B Color, where the most vibrant gemstones meet fine craftsmanship. Our carefully curated gemstone inventory features every color of the rainbow, and all of those in between. We offer you access to viewing a selection of gemstones personalized to your interests, across a wide range of types, shapes, sizes and of course colors. Any ring or jewelry design from Lauren B can be custom made to suit the center stone of your choice, so it's time to start designing the beautiful and unique gemstone piece of your dreams! 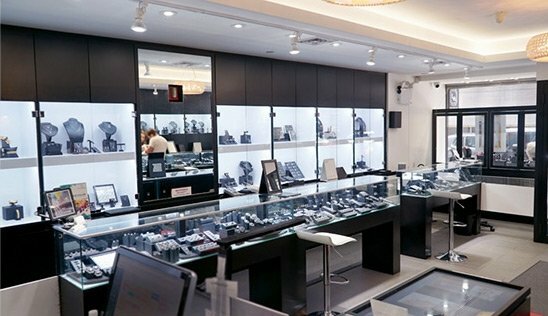 Our gemstone program is available both in store and to remote clients worldwide. Come explore Lauren B Color with us today! Comes in every hue, tone, and saturation possible! Purity and intensity of the color is what drives cost and can either occur naturally or from various treatments. 9 Makes a great, durable stone for any type of jewelry, especially a ring, and is great for daily wear and passing down for generations. Any shape or type of cut. Faceted stones often mixed cut and is optimized to show the best color. Can often be a deeper cut stone to highlight or deepen color. Cabochons, slices, and more unique cuts are readily available and used for jewelry pieces. Most often heat treated. More invasive treatments such as lattice diffusion (use of heat and chemicals to diffuse colors within the stone) can affect price. For heated and/or treated stones, cost can start at a few hundred per carat and range to tens of thousands for rare, naturally occurring colors. Certified, high quality stones will fetch a premium. Corundum is pleochroic, meaning it can show different colors or tones in different light and from different angles. Sapphires can also commonly be bi-color, showing two colors, or a mixture of color. Ruby: only applies to corundum that is a pure red color. All other colors are called “sapphire. Many colors, most notably green, blue, and pinkish for emerald, aquamarine, and morganite.May also be multi-colored. Uncommon colors are red and yellow. 7.5 to 8 Though harder than most gemstones, more susceptible points in the crystal structure can mean that beryl must be worn carefully, especially emerald. Comes in most shapes and cuts and varies by color or variety. Step cut stones are common due to the elongated shape and structure of beryl crystals. Wide variety of treatments based on the variety and color of the stone. Emeralds are almost always clarity enhanced using various methods, particularly fracture filling to enhance clarity. Moderately priced to very expensive; particularly in fine emeralds. Morganite: Orangey-pink to purplish color, often high clarity and moderately priced. Aquamarine: Blue to greenish-blue and moderately priced. 7 to 7.5 Durable stone that is good for everyday wear and requires proper care for longevity. Any cut or shape, even rough or sliced. Crystal structure is very long, so is often found in step cuts, or more elongated shapes. Many stones not treated, but some colors can be attained or enhanced from heat treat- ment. Some types can also be clarity enhanced. From poor commercial quality costing a few dollars, to one of the most expensive gems on the market. Comes from many locations around the world, but the most famous is Minas Gerias state in Brazil, which produces the most various types of gems than anywhere in the world. Paraiba: Copper bearing, blue, greenish-blue, or green. Extremely rare and expensive.Very bright even when saturated with color. Can be found in a wide variety of colors. 7 Durable stone that is good for everyday wear and requires proper care for longevity. Varies greatly based on the variety, but some varieties exposed to normal heat treatment. Pure quartz is silicon and oxygen, making quartz one of the most abundant substances on Earth, and making Earth a silica based planet. Topaz: Commonly blue. Imperial/precious topaz is pinkish to orange Citrine: Color from heat is yellow to orange. Less valuable than topaz. Prasiolite: Light, minty green quartz. Others: Chalcedony, jasper, agate, rose quartz, smoky quartz, onyx, aventurine, carnelian, tiger’s eye, opal, moonstone, and many more. Light to dark green, or yellowish green. Most desired color is vivid, grass green. 6.5 to 7.5 Suitable for everyday wear but should be set in a more protective style setting like a halo or bezel and requires proper care for longevity. Any shape or type of cut. Brilliant faceted stones are often very bright and high luster. Often, but not always heat treated. Non-heated can increase pricing. Called Tsavorite after the Tsavo National park in Kenya, though it was discovered nearby in Tanzania. Often occurs with Tanzanite. Merelani Mint Garnet: A lighter tone and saturation, giving this stone a cool, mint green color. Looks amazing with rose gold! Numerous colors, but most famously blue to violet. Pure blue is the most desired, but some people actually prefer a more violet-blue tone. 6.5 Must be worn with care. If worn in a ring, a more protective setting such as a halo or bezel is encouraged. Various cuts and shapes. Often found in unusual, custom cuts. Heat treatment is common and expected yet does not influence price because it is expected. The level of color vibrancy, whether heated or not, determines cost. Untreated tanzanite is very rare and expensive, but typically an expensive gem despite treatment, comparable to fine sapphire. Good alternative to sapphire, but not quite as durable. Untreated tanzanite is trichroic, meaning it can show 3 different colors. After heating, it becomes dichroic, showing different blue to violet shades. Mined exclusively in Tanzania. Comes in a huge variety. Red, pink, blue, lavender/violet, dark green, brown, black, and colorless. 8 Very durable stone that is great for everyday wear and offers longevity. Any shape or type of cut. Faceted stones come in mixed cuts and are optimized to show the best color. Top quality stones are unheated, but heat treatment and more advanced treatments can be used. Synthetic spinel has been around for quite some time and has use in jewelry as well as commercial and industrial applications. 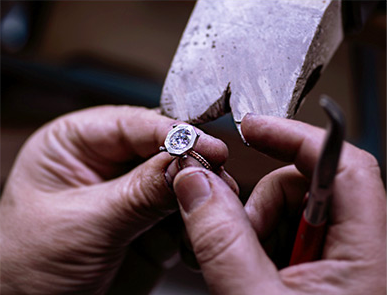 A gemologist can differentiate natural versus synthetic. Huge range of price based on color, quality, and treatment. The best alternative to sapphire. Before modern gemology, red spinel was categorized as “ruby”. Many famous “rubies” in royal collections are spinel. This also goes for blue spinel, which is often confused for sapphire. Mahenge Spinel: A region in Tanzania most famous for pure red and vivid pink spinel. Burmese Spinel: Some Burmese stones have the purest colors seen. Yellowish-green to green to greenish-yellow. The purest is green with no trace of yellow or brown, typically seen in larger stones. 6.5 to 7 Fairly durable but must be worn with care. Does well in a halo or setting with the stone more protected. Prone to abrasion. Standard faceted cuts and shapes along with cabochon. Faceted peridot shows strong doubling and high luster, which adds up to a very nice brilliance. Less expensive to moderate, depending on color, origin, and quality. Olivine peridot is often found in meteorites, as well as on the moon and mars! Fine peridot often comes from from Pakistan, as well as Myanmar (Burma). Can be over 4 billion years old, forming at the very birth of our solar system. Popular in ancient Egypt where it was also mined to non-existence by the Pharaohs. Body color: Color of the actual stone itself, which comes in many colors. Black body color is the rarest and most valuable. Common white opal is the most popular. Play of color: Flashes of iridescence, or fire, comes in every color. Price can be determined by amount of different colors, as well as desired colors like red, orange, and purple. 5.5 to 6 Opal is best suited for necklaces and earrings as opposed to rings or bracelets because it is a soft stone that cannot take heavy wear and tear. Not often heated, but lower grade opals can be smoke treated or made into doublets or triplets. Doublets and triplets are fine opal slices, mounted on or in between different materials, which can make it more durable. From inexpensive to one of the most expensive stones possible. White opal is generally inexpensive to moderate, whereas black opal can be thousands per carat. The world’s finest black opal comes from numerous locations in the Australian outback. This stone makes a great Google image subject because they are each so different. Comes in most traditional shapes and cuts, often mixed cut. When well cut, it is a very bright stone that shows very vivid color. Most often untreated, but heat treatment to enhance color is possible. Garnets can be a mixture of different species, creating greatly varied color, so the color is often natural. Lower to moderately priced gem. Comes from many deposits around the world, but one notable one is Western North Caroli- na. Fine specimens can look similar to ruby or red spinel. Malaya or Malaia Garnet is a variety that is more pinkish-orange to reddish-orange, often a nice “sunset” color. Always has orange component ranging from yellowish-orange to red-orange. Very vibrant color. Almost always natural, untreated color. Garnet species are often mixed and are the cause of naturally occurring color. Mid-priced gemstone. Affordable and very bright, attractive color, and size for the cost. The name comes from the Bavarian word “Spessart,” meaning forest, a mountain range in the region where it was discovered in 1880. Vivid color stones often found in East African gem-producing countries. Comes in many colors. Most popular are blue and orange. 7.5 Durable stone that is good for everyday wear and requires proper care for longevity. Comes in most cuts and shapes; almost always faceted. Stones come in mixed cuts and are optimized to show the best color. Heat treatment common. Almost all blue and colorless zircon are heated, with most other colors occurring naturally. Somewhat less expensive to moderately priced. Great stone for brighter, more durable alternative to aquamarine or topaz. Zircon shows doubling, which occurs in doubly refractive stones and appears as a mirror image inside the stone. This enhances the fire and brilliance of the stone. This is NOT to be confused with Cubic Zirconia, which is a low grade, synthetic gem, completely different from natural zircon. Yellow to green. Alexandrite varies and color changes from reddish to greenish. Super fine colors are much more Vivid colors are more costly and have a stronger color change. 8.5 Third hardest gem. Extremely great stone for ring use and every-day wear and longevity. Faceted or cabochon in any shape. Often round, oval, or cushion. Not commonly treated. Color change and Cat’s eye are naturally occurring phenomenal characteristics which cannot really be altered by treatment. Moderate to extremely expensive. Less expensive alexandrite will be a dull color and have a weaker color change, while very expensive alexandrite will be vivid red to green with strong color change. Alexandrite: This is a color change gem which completely changes color in different light wavelengths. The most valuable changes from purplish-red to greenish-blue or green. Alex- andrite can be both Cat’s eye and color change in a cabochon cut.